Men in Waterford, MI may be used to going to the local barbershop to get a haircut. We have changed the way men are getting haircuts in Michigan by turning your everyday corner barber shop into a full men’s salon in Waterford, Michigan. Women have salons everywhere, why can’t we? Specializing in men’s and boy’s haircuts, our gorgeous stylists will ensure that you leave us looking great and feeling even better. You can select from our great service options, including men’s body waxing! Our Waterford location, as well as our other locations (Westland, Madison Heights, Livonia, or Southgate) offer full or partial men’s body waxing packages. Did you notice we love cars? 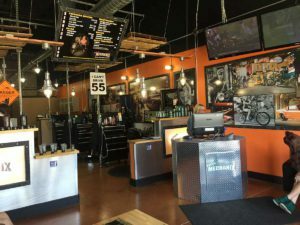 Most men enjoy spending time in their garage working on cars, so we have designed our hair salons in Michigan to resemble a man’s favorite place. Perfect for the mechanic in you! We have even thrown in beautiful women to service your hair cutting needs. To see more details on the services we provide check out our services page. Our Waterford location is located at 6123 Highland Road, Waterford, Michigan 48327. Give us a call today at 1-248-742-1535 for an appointment today!